Sadly we learn that Leo passed away on 19th March 2019 after a short stay in the Princess Royal Hospital, he was 93. My sincere condolences to Leo's family, friends and former colleagues. Leo, formerly a Flight Engineer, flew the following types Douglas DC6, VC10, B707 and DC10 for in a career that started back with Silver City and continued through to BCal. He would have seen some huge changes in a career spanning many years. 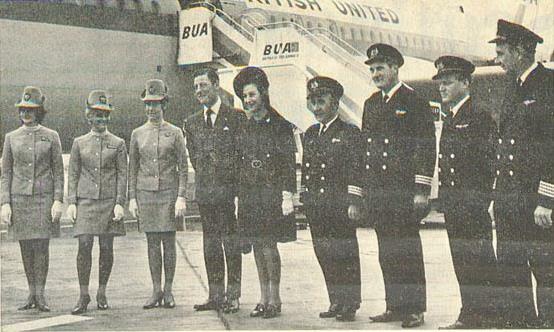 Leo was a very long serving and well respected Flight Engineer with Silver City, British United and of course British Caledonian and British Airways. Sad times. Leo, although known to most as Spud, was a very well known and popular Flight Engineer, Silver City - BUA and onto the formation of BCAL, he was a good friend of Sir Adam. From Marjorie Anglesea Jackson : I remember Spud, condolences to his family and friends, may he rest in peace. Spent a marvelous few hours with Spud while he explained the intricacies of the 707 panel enroute to Caracas. Martin Hole, sadly now gone too, was the skipper. It was a memorable trip. From Jim Stott : RIP Spud. I remember the days when I was first recruited and that you were the one who interviewed me.